This story has the best distillation of why the Baseball Writers Association of America should have had the Hall of Fame voting privilege taken away from them years ago. Former BBWAA president Paul Hoynes of the Cleveland Plain Dealer didn’t need a jury to help him with his decision. He doesn’t need any facts. He knows what the truth is, and that’s good enough. To steal from William F. Buckley, I’d rather have the Hall of Fame decisions made by the first thousand people in the Houston telephone book than these arrogant ignoramuses. Even if you do truly believe that Roger Clemens cheated and got away with it, the simple fact remains that he would not be the first cheater, admitted or not, the be enshrined. 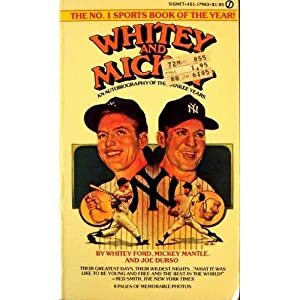 Whitey Ford wrote at length in his co-memoir with Mickey Mantle about the various ways in which he doctored the baseball. Gaylord Perry’s spitballing was the worst kept and most openly joked about secret in the game. (Anecdote reported by Thomas Boswell: Among the substances Perry allegedly used to lube the ball was Vicks Vap-O-Rub. This led Billy Martin, who might have been managing the Tigers at the time, to ask the home plate umpire to “smell the ball, please”, to which the ump replied “Billy, I have allergies and a deviated septum”, leading Martin to fume “Great, I have an ump who can’t see OR smell!”) Both are members in good standing in Cooperstown, and last I checked people like Paul Hoynes – who would have been a BBWAA member when Perry was on the ballot – have never uttered a peep of protest about that. Because that kind of cheating is totally different than this kind of cheating. My way of looking at it is that if cheating is all it took to be a Hall of Famer, everyone would cheat and everyone would be better than they would be otherwise. It turns out that it’s hard to cheat successfully and actually gain an advantage from doing so. Doctored baseballs are hard to control. Way more scrubs than stars have tested positive for steroids, mostly in the minors. Corked bats don’t actually help you hit a ball farther. You can’t cheat your way to the top in baseball. I don’t know why that’s so hard to accept. Pete Rose was banned for life because there was a rule on the books saying if you gambled you’re banned for life and he did it anyway. If I recall correctly, steroids were not even banned when Clemens is alleged to have used them. And of course, nobody could prove he did despite the full resources of the federal government applied to the task. There’s no question he should be in the Hall of Fame. If he’s denied, it says MUCH more about the baseball writers than it does his career.